Best Mughlai Mehndi Designs – Indian henna art is simply too magnificent for words. It’s wide-ranging and expanding all the time and easily incorporates different kinds of interpretations of a design depending on where the artist is from. But all of those designs have one thing in common: and that is the fact that they all look magnificently beautiful. Mughlai henna art gives a royal and superior touch to the traditional designs, befitting queens and princesses. In this article, we’ll present you with our top 40 picks for Mughal looking mehndi art that’s sure to make you feel like royalty. Just to get you started, here’s an amazing one. It gives you an idea of what a mughal design is supposed to look like/ Loving the full look. This gauntlet-like design is perfect for formal occasions. They can imitate real jewellery and convey simplicity at the same time. Talk about dramatic! It’s absolutely heavenly. Get your shaadi groove on with this stunning piece. It’s truly a traditional design with a full mughal look. This look is love and we suggest you go and try this right now for a mesmerizing wedding look. Eye-catching and inspiring. And surrounded by colorful henna candles that makes it stand out more, that’s even better! This one is chic and sophisticated, yet conveys the feel of a mughal design without being too heavy or complicated. Nothing like a literal interpretation to get the message across. Here’s a mughal prince and princess to give actual royal vibes. Sometimes just painting the fingers is enough. The negative space shifts all the focus on the adorned area making it seem more beautiful. In this intricate piece, we see flowers of a different kind packed closely together and moving gently in a curving line. The effect is mesmerizing. Strut around like the princess you are by getting this other worldly art painted on your feet. Such fine artistry! Such intricate strokes! We have been utterly blown away. Don’t you guys agree? Another one to die for! The artist is from a beauty parlor in Pakistan and his/her page is filled with such marvelous creations. Pieces that tell a story are popular, and rightfully so. It takes an incredible amount of steadiness, hard work and concentration, not to mention expertise and practice so don’t go and try this for yourself. Things like these are best left to the masters of the craft. 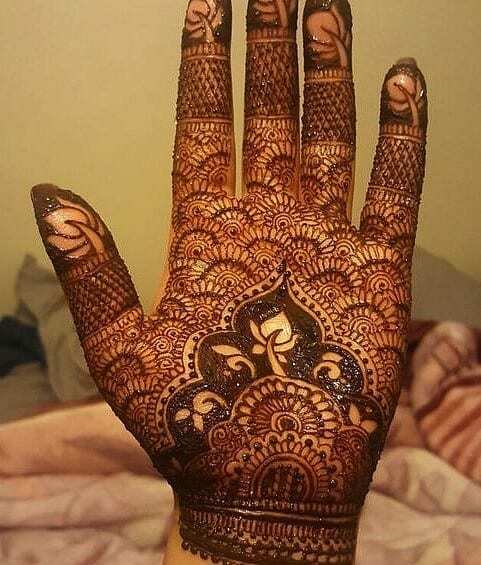 A fine cone henna is best for such a job as you won’t be able to replicate pieces like this if the henna is coming out thick. Having the right tools is just as important. This is the artist (@thehusnakajee)’s own description of the piece and you can definitely see how funky and cool it is. ↓ 24 – Let’s Match! Paisleys, symmetry, mesh, feather-light strokes and filled in spaces later, we have these two masterpieces making us drool. Insane wedding henna inspiration. Nothing like a smattering of flowers and paisleys to make a cheery design. The shading effect applied here is amazing. Again, the artistry of thickening swirls and thin strokes, the negative space as well as packed together flowers, all of these things lend a darker and edgier feel to the design but most of all the credit goes to the leaves. The main part is very simple but look how superbly it has been designed. It covers almost the entire back of the hand and is wonderful in its apparent simplicity. Mesh patterns are almost always guaranteed to work. The process is straightforward but a wobbling hand might ruin the symmetry. It’s neat, it’s all over the place and it has roses. What more can you possibly ask for? Again, not taking credit for naming this, it’s the artist’s own invention. It’s really quite incredible. Who knew demi-mandalas could be so hip? An elegant choice for a bride who wants to fell special on her big day. It’s edgy and well-defined. The darker, filled-in parts are alluring and draw the eye immediately. It’s a bold look and totally recommended. Can’t find a beautiful necklace to complement your look? Well, here’s a solution to your problem! Get your throat decorated with henna resulting in a queenly look. Charming is the word that comes to mind. Unimaginably bewitching even. This has us going oh-la-la! Paisleys belong at the front and centre, like in this beautiful design. Don’t know what it is about them but they seem to carry the whole design they’re in. The title pretty much says it all, doesn’t it?! Loving the exquisite fine detail on this one. For a polished and refined, yet simple and quick look, this is highly recommended. The dotted lines give the impression of chains linking in an elaborate jewellery piece which is why such mehndi designs have a great mughal look about them. That’s sort of what princesses in those days did, probably. Playing and talking with birds in gilded cages while passing the time in cages of their own. Makes you lost for words, doesn’t it? We don’t blame you. We’re also picking our jaw off the floor. When it comes to Mughlai designs, the focus is as much on the feet as on the hands. It’s so that when your feet poke out of your lehngas, they complete the royal look. Peacocks are famous for being beautiful, arrogant and regal, all qualities associated with royalty. Helps that they were also kept as pets by kings and queens. Three words: Drop. Dead. Gorgeous! It’s possible to mix it up and still end up with an impressively majestic outcome. Meshes can be tricky but it’s so worth the effort. Ending it off with this comparatively less heavy but no less luxurious design by husna kajee. So that’s it! We do hope you enjoyed our top picks and found the henna inspiration you needed. So get a cone, get set and go! Oh, and don’t forget to check out our other articles if you liked this one.